V.S.B. 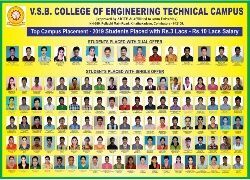 Engineering College has built up a reputation of higher academic standards in all specialties of Engineering since 2012, a true reflection of dedication and hard work. One of the pillars of such high standards is its high quality Library facilities. This college’s academic excellence is reflected in its harmonious blend of infrastructure and its academic environment with high quality library. V.S.B. Central Library caters to the information needs of the institute’s faculty, students, staff and researchers. It houses around 14822 books covering all disciplines of engineering, technology, and management. The collection in the Library comprises printed documents such as books, journal back volumes and reports. The non-book collections include materials like audio/video cassettes, and CDROM discs. There are Slide Projectors and other allied equipment’s in the Audio – Visual Library. Under the web consortium, the Library provides on-line access to a large number of full-text journal databases from DELNET publishers. These e-journals are accessible on intranet to campus users only. The Library provides various services for its members such as lending of books and journal back volumes, reservation of books, photocopying, CDROM, Internet services and video screening. All the Library activities are computerized, including bar-coded ID cards and separate On-line Public Access Catalogue (OPAC) terminals for searching books in the Library. Our library intends to incorporate the latest technology and adopt user friendly approach towards student And faculty. Users must keep their belongings at the “Property Counter” before entering into the Library. Users must scan their ID card in the system kept at the entrance during entry as well as exit. Before leaving the Library, all users are required to produce all books and items taken for inspection. More than two consecutive renewals will not be allowed. Books that are in special demand may be called for at any time if required. Library books must be returned when students go home on long vacation. Magazines and Journals are ordinarily not let out. After reference they must be kept in their respective places. Users should leave the books on the tables after reading. Misplacement of books in different shelves is punishable. Underlining, scribbling, tearing of pages or any other type of mutilation of books, journals etc., as well as mishandling or misuse of computers will attract appropriate punishment. If any book / journal are taken out of the Library without proper entry, serious action will be taken. All borrowers must settle down any overdue loans before they are permitted to borrow again. The competent authority will take necessary action against the users who violate the Library rules and regulations. Notwithstanding anything contained in the above rules, the decision of the authorities of the Institute in all matters related to the Library services and usage shall be final and binding on all users.